Like many women, I am somewhat obsessed by the Breton top. It’s an absolute classic – a garment that’s synonymous with Audrey Hepburn and French style in general is always going to be stylish. However, like many classic items, you see them styled the same way over and over… We all want a little inspiration when it comes to styling the staples in our wardrobes, don’t we? 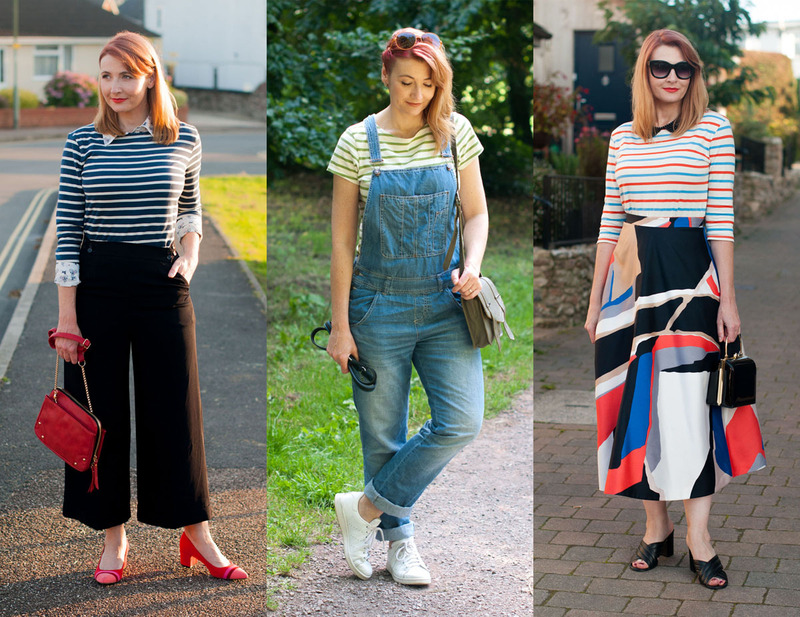 As I’m working with Seasalt this year – a brand that excels in striped sailor tops – I thought I’d show you a few alternative ways to style your Breton stripes: Not a trench coat in sight, in other words (that would be too easy, and too easy just isn’t my style as you probably know)! The top is called a Breton shirt because many sailors were from Brittany – a marinière (sailor) top was worn by quartermasters and seamen in the French Navy. It was originally made of tightly knit wool to protect them from the elements. In 1858, the combed cotton jersey and sweaters officially became part of the French naval uniform, with strict specifications about the number of stripes and their size (it’s said they represented the number of Napoleon’s victories). It was said that stripes made it easier to see sailors who had fallen into the sea. Coco Chanel used to holiday by the sea and was inspired by the uniforms of local sailors. The marinières that she became so well known for soon became luxury items after she introduced them exactly 100 years ago in 1917. The marinière has famously been worn by Pablo Picasso, Audrey Hepburn, John Wayne, Brigitte Bardot and Jean Seberg – it is a wardrobe staple of many French women (and men!) and closely associated with French style. Jean Paul Gaultier, Yves Saint Laurent and Chanel are all fashion houses that have featured the Breton shirt heavily in their collections. Gaultier himself is known for wearing a marinière and his aftershave Le Male is shaped as a male torso in Breton stripes. Seasalt’s been making Breton striped tops for years – it was actually the first garment they ever made, so they know what they’re doing. Their sailor tops, shirts and t-shirts are made with 100% organic cotton, are incredibly soft and made to last (you can tell they’re amazing quality at a glance). They also have a wide selection of colours and sleeve choices (short, three-quarter and long) – not only that but they have a 2 for £40 offer on their sailor stripes. There’s no end date on the offer yet, so you can indulge in two at a time to your heart’s content (especially good when there’s so much choice). The offer also includes some plain tops and leggings so you don’t have to go overboard (see what I did there!) with the stripes if you feel you need to reign in your Breton habit a little… Though is there such a thing as too many Breton tops? I don’t think so…! 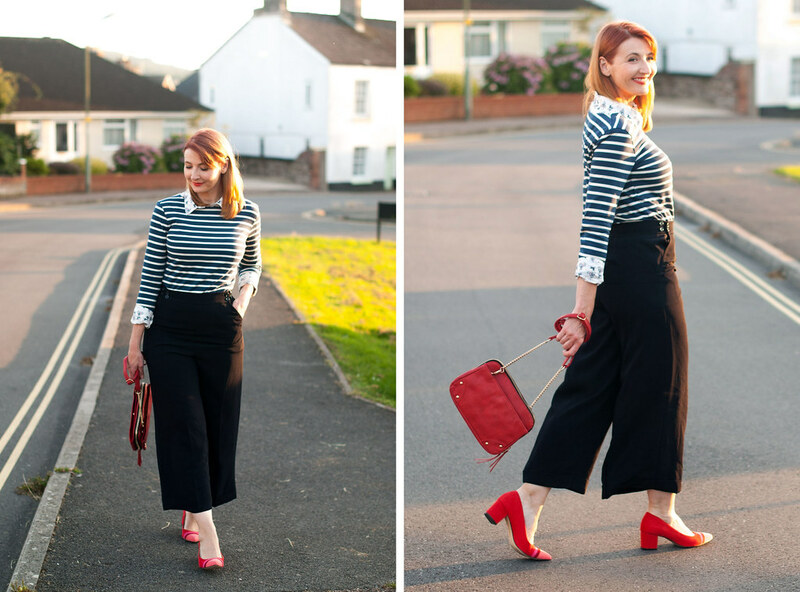 As part of my Seasalt ambassadorship I was set the challenge to style three sailor tops three creative ways. 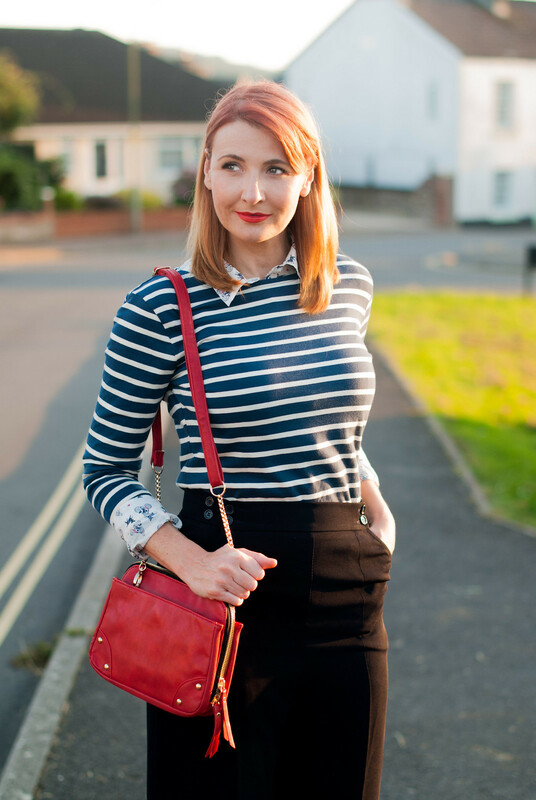 As much as I love the classic Breton top/skinny jeans/ballet flats/trench coat look, it wouldn’t be showing you anything you haven’t already seen a thousand times before – so I tried to style mine a little differently. It also made sense to style three outfits for three occasions: Office workwear, casual weekend wear and a date night outfit. I love all three looks equally – it goes to show that a Breton top really IS the most versatile piece you can have in your wardrobe. My outfits may still be a little on the preppy side, but (in the same way I tend to describe my style) these are definitely what I’d call “preppy with a twist” looks. Hopefully they’ll give you some stripey inspiration… Enjoy! Ah, the most classic of classic tops: The long sleeve, navy Breton top. Navy is, of course, perfect for the office and this outfit is great if you work in a slightly more creative environment. I layered the top over another Seasalt piece: the Pepé print Larissa Shirt. This shirt is one of those shirts that you can wash and twist to keep the crinkle (though I chose to iron it for this outfit as it’s workwear)… the pattern mixing works so well here. Adding smart culottes and a punch of colour with red heels, bag and lips (very matchy matchy I know, but I think it works because the shoes have bands of different colours) makes it the perfect office look that’s far from being just a boring navy and white outfit. 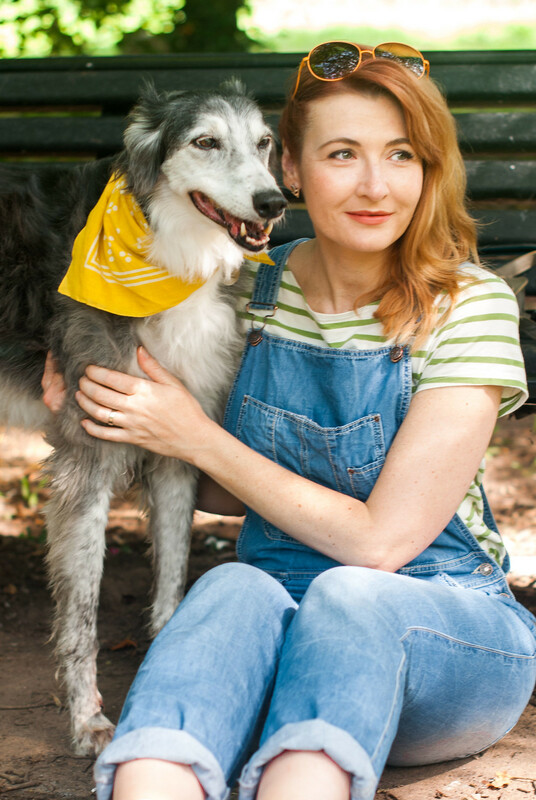 Apart from the fact that dungarees are the best thing since sliced bread for weekend dressing, can we just address how adorable Riley looks in his yellow dog neckerchief? Seasalt are big fans of dogs (they’re welcome in all Seasalt shops) and I love the fact that they sell gifts for pets and feature the co-founder’s cockapoo Pepé on their website a lot – he appears on the print of my shirt in the first outfit if you look closely! As I mentioned earlier Seasalt sells Breton tops with different sleeve lengths, and this t-shirt with short sleeves and a green stripe is quite unusual… you don’t often see green Breton stripes but that’s what I love about their range: choice. 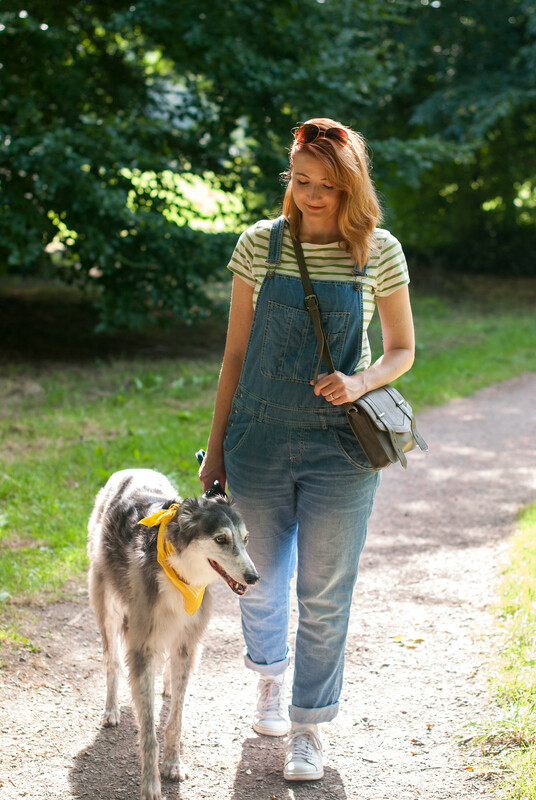 Dungarees, a Breton t-shirt and Adidas for comfort is really all you need for easy weekend wear – I think this outfit makes a (much more comfortable) change from skinny jeans. Breton tops don’t have to be for daytime or casual wear only. 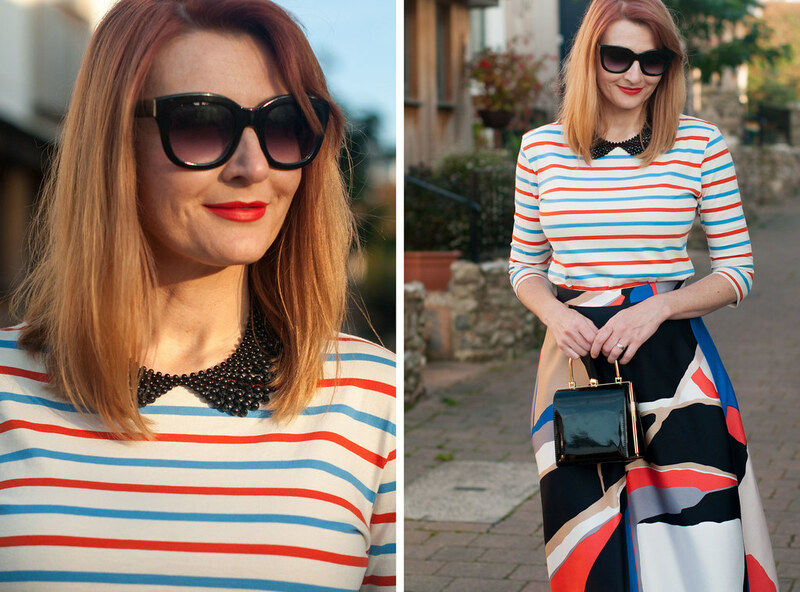 I thought I’d try dressing up my blue/orange/ecru sailor top (love the three-quarter sleeves) by creating a date night outfit round its bold colourway. It was a no-brainer to wear it with my full graphic print midi skirt that I actually got last year but haven’t yet worn – I now have the perfect “going out out” outfit! The colours of the stripes couldn’t have been more perfect with the colours of the skirt, and as it was quite an almighty pattern mix I kept all the rest of my accessories black (even I know when to hold back a little). 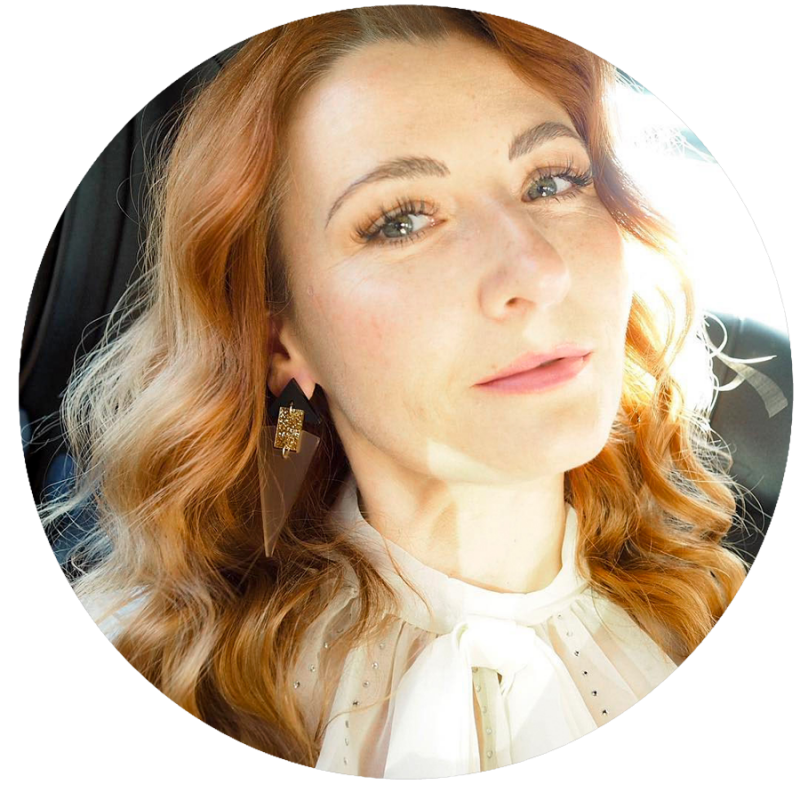 My favourite part of the whole outfit is the addition of the Peter Pan collar-style necklace (which I’ve had for years) to the top – it takes it from being a casual daytime top to suitable for an evening out in one fell swoop. Second only to the red lipstick, of course. Adding a statement necklace to a Breton top is a great tip to make your stripes look far dressier than just a jersey t-shirt. 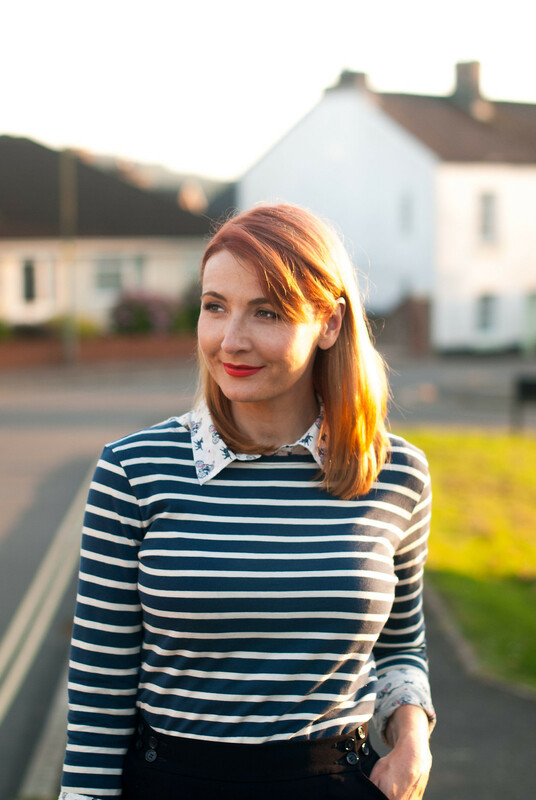 So that’s my three looks for styling your Breton stripes in ways that I hope have inspired you to switch things up a little as well as getting the most out of your wardrobe. Sometimes we have to experiment a little to find ways to wear classics in different ways – it would get boring to wear them exactly the same way every time, wouldn’t it? Don’t be afraid to try new ways to wear your stripes as well as new places to wear them. First stop date night, next stop… wedding dress? I’m sure Gaultier has already been there and done that…! 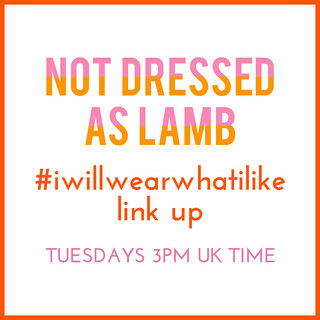 Onto the #iwillwearwhatilike link up: Do add your outfits below – and if you’ve added a link to here or my button to your post you may be featured next week! HOW MANY BRETON TOPS DO YOU OWN, AND WHAT’S YOUR FAVOURITE WAY TO STYLE THEM? COMMENT BELOW…! Disclosure: The post was sponsored by Seasalt (click here for my full disclosure). This post may contain some affiliate links which means if you click through and buy I may receive a small commission. All content is original, however, and opinions are my own and 100% honest. Red accessories with stripes always looks so good! I love third outfit with the patterned skirt and Peter Pan collar necklace too. I have loads of Breton tops, they just go with everything. My dad lives in Brittany, which is where my step mother is from, and the classic navy and white striped tops are sold in all the shops. I thought it would be a bit of a cliche to wear Breton stripes in Brittany but it's not at all – my step mother wore a striped top and trousers on her wedding day to my dad! I love the print mixing! I have quite the collection of striped tops so this inspiration is right up my alley! 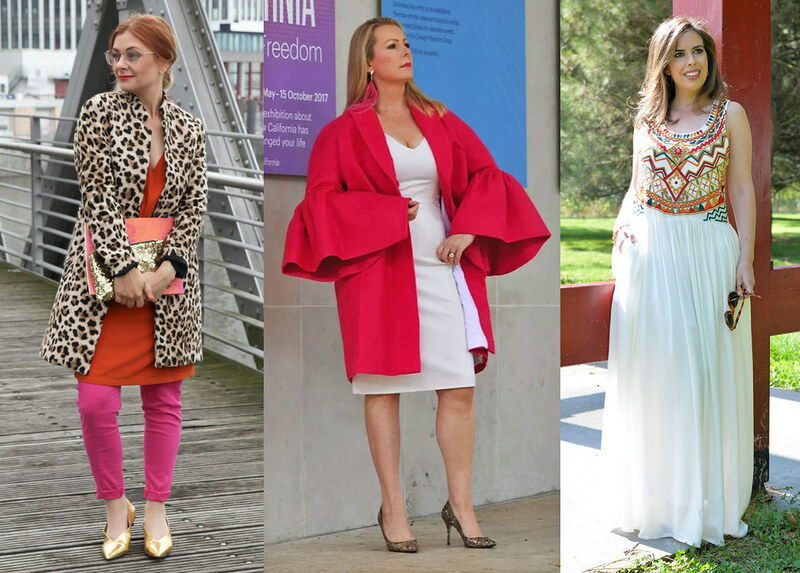 These looks are fab Catherine! I would wear all three in a heartbeat. 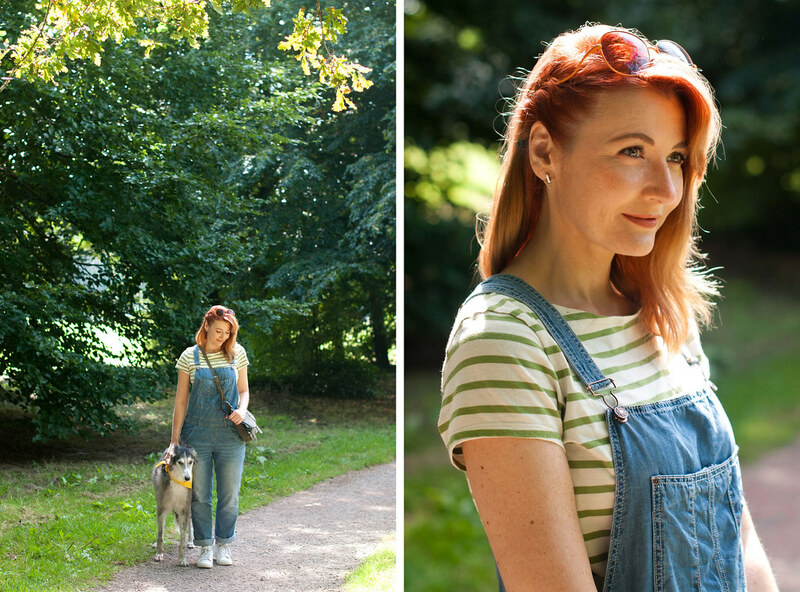 The dungarees outfit is my favourite though… I love the green striped top. A little different but still classic. 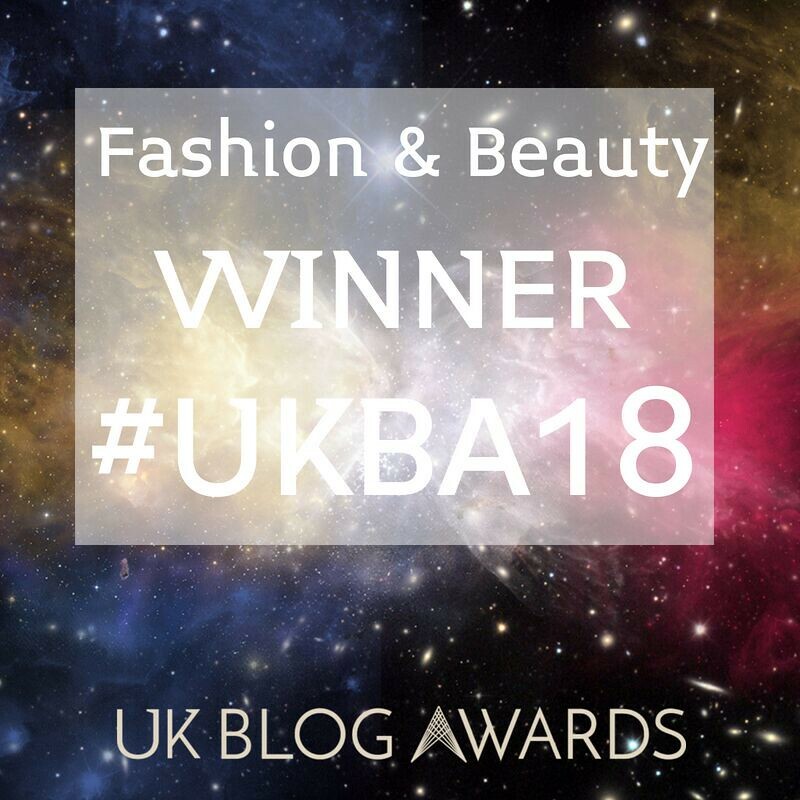 Fake Fabulous | Fake it until you make it | Style & Fun with Fashion! I love striped tops, and your post made me realize why I need more! 😉 I love all three outfits, especially the date night one as it's not something I would necessarily think of. Thanks for the link up & I hope you are having a great week! I love all of these options but the last one is so terrifically creative it's difficult not to pick it as a favorite. This bverdion is work friendly too!! I love how you styled all three looks!! I think the last might be my favorite, the mix of patterns is so fun! I love mixed print look! That skirt is gorgeous and looks great with a casual top! Love Breton stripes – I've had at least one in my wardrobe ever since I was a teenager – I'm now 71 and still have several, latest bought last year in France. Your styling shows just how to get the best of these tops. I particularly like the addition of the black beaded collar necklace on the evening outfit with the skirt. Great pieces together. 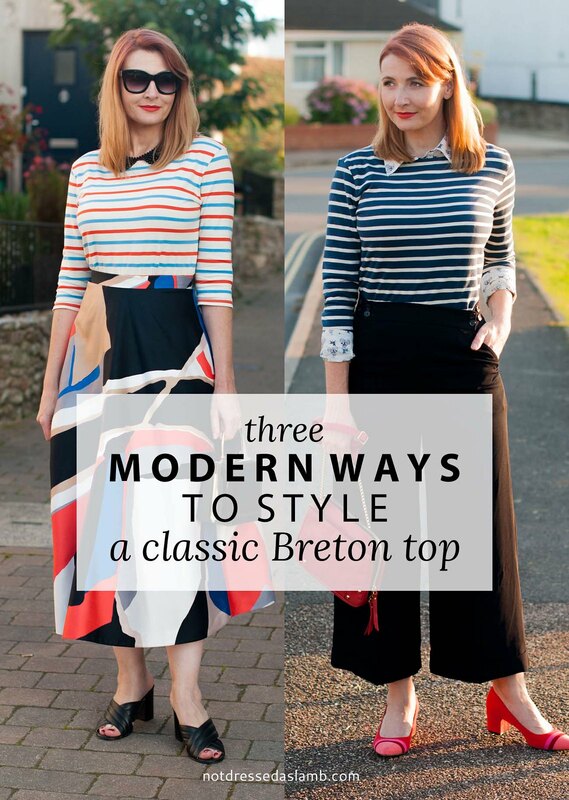 I love Breton tops and these are all great looks for different occasions. And thank you for the history! I have always wondered about that. 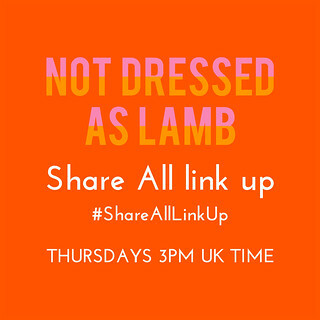 And by chance I happened to wear a Hepburn/Tautou outfit for this linkup too. Thanks for hosting. It's so interesting how stripes can make an outfit seem so much better….I mean they are just stripes. But for some reason they are so obsessively wonderful!! I'll join you with stripes! Striped tops are a marvelous classic to have in your wardrobe and you've done such a wonderful jacket b of providing some history regarding its origins. I'm also a firm believer the nearly all items in our closets can be worn for any occasion and for the last year, I've been posting a very similar post once a month showcasing a different piece from my wardrobe and styling 3 ways; for work, for play, and for fun. I added my last one to the link up. Thanks for the inspirations of wearing what we like and for hosting.